CHICAGO, Illinois, June 23, 2010 (ENS) – One invasive bighead Asian carp has been found in Lake Calumet along the Chicago Area Waterway System – the first fish that has been found above the U.S. Army Corps of Engineer’s electric barrier system built to keep out the voracious exotic species. The capture of this fish was announced today by the Asian Carp Regional Coordinating Committee, RCC, a group of federal and state agencies and the City of Chicago. Asian carp threaten to enter the Great Lakes through the Chicago Sanitary and Ship Canal, a constructed waterway that is the only direct water link between the Mississippi River and Lake Michigan. This capture is the first Asian carp discovered above the electric barrier system and the second in the Chicago Area Waterway System. The first invasive fish was found in December 2009. These fish were imported by fish farms decades ago and introduced far south of Michigan, in the Mississippi Delta. Escaping from the fish farms because of flooding, they swam up the Mississippi and have now been seen as far north as the Dakotas, in the Missouri River basin. Scientists, government regulators and environmental groups agree that the invasive fish pose a threat to the Great Lakes because they can grow to more than six feet long and 100 pounds, quickly dominating any habitat they reach. They eat as much as 40 percent of their body weight every day, starving native species of food and upending ecosystem balances. These fish jump high out of the water, sometimes landing in boats. The RCC agencies say they will enact immediate measures to remove any additional Asian carp found during sampling efforts, including but not limited to electrofishing and netting. 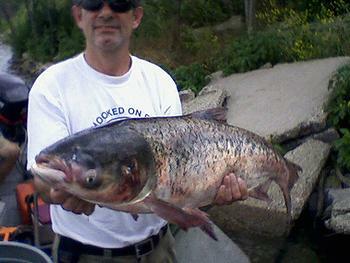 The bighead carp, measuring 34.6 inches long and weighing nearly 20 pounds, was found in Lake Calumet which sits between T.J. O’Brien Lock and Dam and Lake Michigan. A commercial fisherman contracted by the Illinois DNR to conduct routine sampling for carp found the fish in the northwest corner of Lake Calumet near the Harborside Golf Course, six miles downstream of Lake Michigan. “Federal agencies have repeatedly told us they have the funding and the authority to prevent migration into the lakes. It is overdue that they fully use it,” said Levin. “I support closure of the locks and many other measures to stop the carp from migrating into the Great Lakes, including hydrologic separation of the Great Lakes, greater use of piscicides, and increasing the voltage of the electric dispersal barrier to prevent carp of any size from crossing the barrier,” he said. Environmental groups throughout the Great Lakes are advocating quick action to impede the carp’s swim towards Lake Michigan. “Asian carp are like cockroaches, when you see one, you know its accompanied by many more you don’t see,” said Henry Henderson, director of the Natural Resources Defense Council’s Midwest Program, and a former Commissioner of the Environment for the City of Chicago. “This live bighead carp was caught well beyond the electric fence that was supposed to stop them, only six miles from Lake Michigan. There are no other physical barriers before these monsters reach Lake Michigan,” said Andy Buchsbaum, director of the Great Lakes Office of the National Wildlife Federation. While Mike Weimer, U.S. Fish and Wildlife Service assistant regional director of fisheries, called the carp issue “an extremely high priority for the Service,” federal officials are not yet prepared to close the locks.